Our marionberry patch is exploding this year so we made a crisp last week to pair with vanilla ice cream when some friends came for dinner. Below is the recipe and some photos. Our backyard marionberry patch with berries just right for picking. Several years ago my husband and I were up visiting my folks outside of Bellingham. My mom and her husband live next to a defunked marionberry field and my husband is a freak about gleaning seeds from everything he can legally (and almost legally) get his hands on. Naturally, the temptation to relocate a couple of these languishing plants was too much for him (He’s probably cringing as he reads this). Marionberries the size of my thumb. What a blessing. Fast forward to 2014 and we have a healthy marionberry patch in our side yard. True, they are as invasive as blackberries and raspberries but we keep them corralled and it hasn’t been a problem. He also maintains a very small patch in a corner of our front yard that he uses to give cuttings to friends who want their own. For a few years he was making marionberry jam but, truth of the matter is, I only eat jam with cheese plates and save my carbs for grilled tuna sandwiches, pasta and rice so now we pick these little treasures to share with neighbors, eat with oatmeal in the morning or make an occasional Marionberry crisp. Before the crumbly topping goes on you can see the apple shreds. The sweet berries with the slight tartness keeps it from being too syrupy. 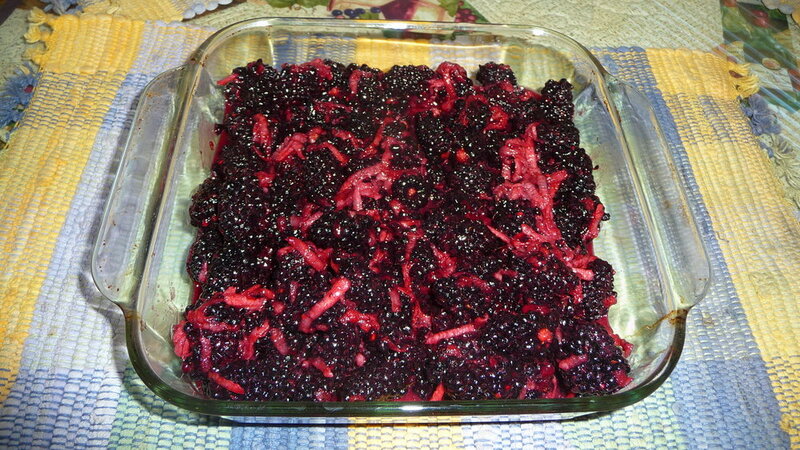 This recipe was taken from www.ohsweetbasil.com/2013/06/marionberry-crisp-a-la-mode.html and it turned out wonderfully. I would not hesitate to pair it with a port wine and may I suggest Hood River Vineyards' marionberry port? I've been a huge fan of Hood River Vineyards for years. I personally think they have some of the best wine in the Gorge. They are the oldest winery in Hood River and not only are their wines wonderful, their line of dessert wines are just knock-it-out-of-park amazing. A great side shot of the crisp with the brown sugar-oatmeal topping and marionberry mixture layered perfectly before being popped in the oven. Notes: You can use whatever fruit is the most fresh, and for apples and peaches you can leave out the flour.